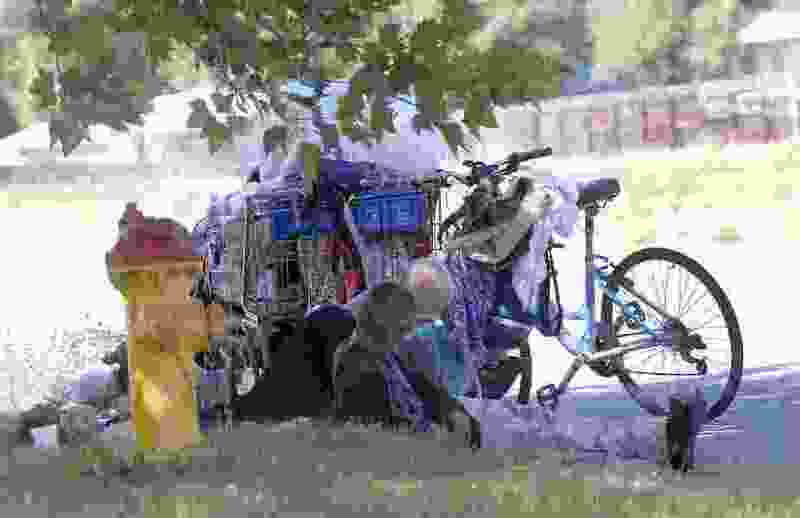 (Al Hartmann | Tribune file photo) Homeless people pick a shady spot curbside with their belongings at 1100 W. 100 S. near Jordan Park in the Poplar Grove neighborhood on Friday August 25, 2017. Advocates for the homeless are launching a campaign seeking to raise $8 million for new homeless resource centers in Salt Lake County — which could turn into $16 million because of a challenge grant. The Larry H. and Gail Miller Family Foundation issued a dollar-for-dollar challenge grant of up to $10 million 18 months ago. So far, only about $2 million has been raised by Shelter the Homeless toward matching that grant. So the group is launching a radio, TV and digital ad campaign seeking to raise the additional money. Donations may be made online at Home4Change.com. “There is still a lot of work to be done, and we need everyone to come together to support this critical community effort,” said Gail Miller, chairwoman and owner of the Larry H. Miller Group of Companies. “We are grateful to be among those who have contributed their time, resources and funds to make the new homeless center model a reality,” she said. Groups are working toward closing The Road Home shelter downtown, likely in the fall, and transitioning homeless residents to three new homeless resource centers — two in Salt Lake City and one in South Salt Lake City. Each will not only provide a safe place to sleep, but also offer a wide range of services from housing assistance to job training, life skills, food, medical care and connections to long-term community support. Clarification: The Road Home downtown is scheduled to close by fall. The original version of this story did not specify whether it was the downtown or Midvale shelters.